NINA is Pet of the Week in the October 24 edition of the Salem News. And NINA is available for adoption. Female kitten, 4 months old. NINA likes to play with toys and is good at playing kitty “soccer” as she chases a rolling ball in between her front paws. When she gets to know you, Nina will jump up on your lap or sit near you, and enjoys being stroked. The white kitten with the black spots would do well with another kitten or cat, in a household with or without older children. She may even adjust to life with a dog. Nina has had all her shots (distemper and Rabies), and the required feline tests. Nina uses her litter box regularly. 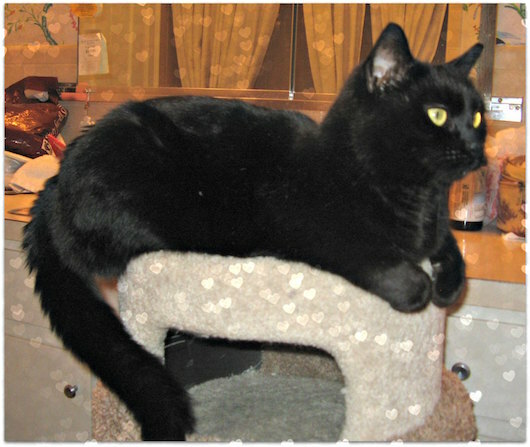 She would enjoy having a cat perch or place near a window to watch the birds and world outdoors. If interested in this kitten, contact Cheryl, her foster mom, at cmezack@aol.com, (978) 578-0588.